Assure personal alarm system - elderly, carers, lone workers and disabled. Choose a broadband base if you already have a reliable internet connection or a cellular enabled base. Then choose whether you prefer yearly or monthly terms. Everything in the 'family & friends only' system is included in the price. 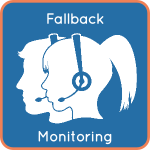 Once the system is in your 'shopping bag' you will be given the option to add our professional fallback monitoring service from £2.50/month, in case there are times when family & friends are unavailable. The Monthly Plan costs £159.88 in total for year one and £119.88 for each following year. The Yearly Plan costs £199.99 in year one and then £74.99 for each following year. The Monthly Plan costs £212.38 in total for year one and £149.88 for each following year. The Yearly Plan costs £249.99 in year one and then £99.99 for each following year. VAT exemption - do you qualify?